April was a good month for The Little Pink Bakery. I had orders every week and I was able to use a little bit of creativity on a lot of the orders. Read below to get a little more detail about each order and to see images that will make your mouth water! These cake balls were for a bridal shower. I made pineapple upside down cake and wrapped the cake mixture around a cherry before dipping the cake ball in white dip. I used burgundy and light pink drizzles to match the bride’s wedding colors. These turned out so cute! I had an old high school classmate contact me to make cake balls for her winterguard team. They travelled all the way from Texas to Dayton for the WGI Championships and she wanted to try my cake balls. I made chocolate and vanilla cake balls dipped in chocolate and white with the same drizzle. This classic combo is always a hit! Every month or so, my dad orders a batch of cake balls to bring to his coworkers. I think he’s my best customer! He loves the chocolate cake balls dipped in white, and he lets me choose the drizzle. This time, I went a little patriotic and did a red and blue drizzle. These maroon and white dipped cake pops went to a softball player at a local high school for her birthday. The colors matched the school colors (and her uniform). I’m hoping to get more orders for school colors because I loved making these! These vanilla cake pops went to ANOTHER bridal shower. 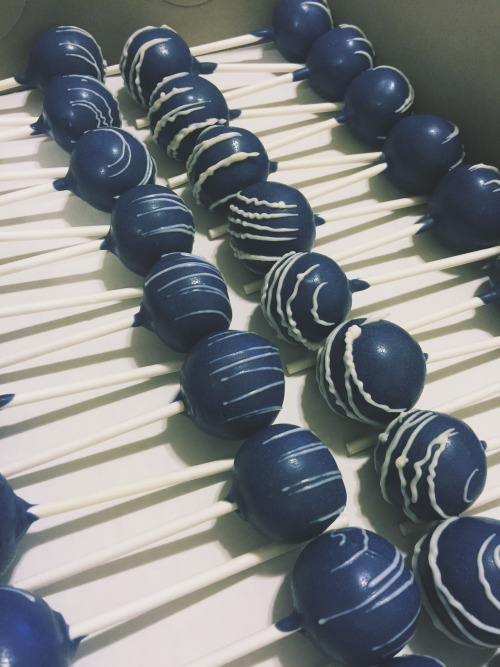 The cake pops were dipped in navy blue to match the wedding theme. It seems I’m starting to get on a roll with these bridal showers. I had a big order toward the end of April that consisted of white, chocolate and strawberry cake balls dipped in white with blue and green drizzle. The drizzle matched 5/3 Bank’s colors as these were for a bake sale at the bank. Included in this order was Unicorn Bark! If you want to see how I made this bark, click here! This is simple to make and I always throw in some pretzels to break up the super sweetness. My final order of April was chocolate and strawberry cake balls. These traveled to Indiana for my friend’s mom’s birthday. I dipped these cake balls in white and drizzled them in light pink. This is my favorite color combination! I can’t wait to share more orders with you guys in the future! If you have anything you’d like me to try (or if you’d like to order), please send the idea or recipe to littlepinkbakeryohio@gmail.com and you might just see the recipe on this site soon!